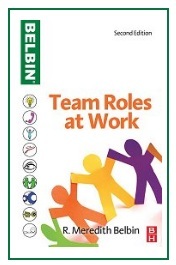 If you are really interested in learning and developing skills in teambuilding, there are certainly no books on the market that can beat Belbin’s books in this subject area. Exceptional! Team Roles at Work is a follow-up to Meredith Belbin’s highly successful book Management Teams: Why They Succeed or Fail. In this book, the nine Team Roles – now familiar to managers and management trainers all over – are explored further, adding value to the original Team Role concepts. Operational strategies provide ideas, techniques and a new range of information and advice which can be used to the organisation’s advantage. Team Roles at Work offers managers a practical guide to improving their teams within the workplace to deliver significantly better results for their company, reflecting well on them as a manager, whilst also saving them time and energy, by using each team member to their best advantage to achieve overall team goals. Now fully updated for today’s managers and students Team Roles at Work takes the academic background of the team roles method and offers a more practical approach with a new structure and visual aids such as tables, illustrations and graphs to ease learning. A team is not a bunch of people with job titles, but a congregation of individuals, each of whom has a role which is understood by other members. Members of a team seek out certain roles and they perform most effectively in the ones that are most natural to them.